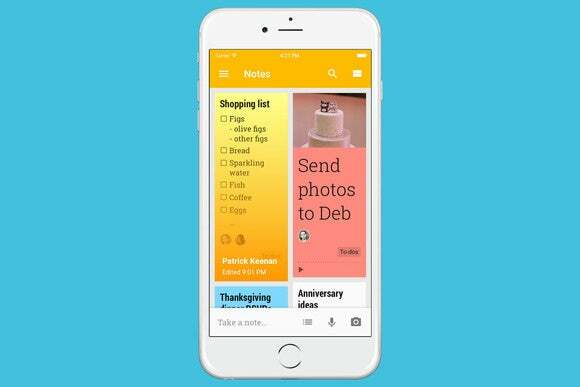 Google's Keep app for iOS is now a bit more competitive with other apps like Evernote thanks to new features the company added Thursday. Users can now access Keep from a new Today widget they can add to Notification Center so that it's easy to start up a new note or open one they recently edited without having to sort through the app first. It's also possible to add things to Keep from other applications (such as Google's Chrome Web browser) using a new sharing extension that the company built. That feature lets users open the share sheet inside an application, push the Google Keep button, and load information into Google's note-taking program without having to leave what they're doing. Users can also add a title and additional notes, plus a label to categorize the note. It's a way to clip things from applications that support iOS's system share sheet, which gives Keep access to a wide variety of apps. Case in point: People who want to remember a particular tweet from the popular Tweetbot client can save it into Keep with two taps. That's a marked improvement over having to copy down a link, switch into the Keep app and then paste it into a new note. Both features are in line with what Keep's competitors, Evernote and OneNote, have had on iOS for a long time. Google's note-taking service has been around for a while on Android and the Web, but it is playing catch-up on iOS. The company only released a version of the Keep app at the end of September, after a years-long drought when the only way iPhone and iPad users could connect to the service was through apps built by third parties.